OK, we promise this is the final question - and no, you will not be graded on this. 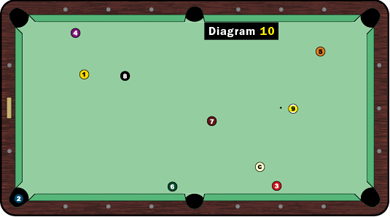 Take a look at the layout above - one of many tables cleared by Mika Immonen en route to winning the 2008 U.S. Open 9-Ball Championship. Whether you want to scribble on this page (we won't take offense) or try it out the next time your at the table, see how'd you approach this layout.